Rabbi Lisa Hochberg-Miller has been the spiritual leader of Temple Beth Torah since 1997. She brings an unparalleled sense of warmth, genuine care, energy and love to our temple community. You can come to know her best through the sense of community she brings to weekly Shabbat services. Her passion for teaching is evident in her Sunday morning adult learning opportunities, weekly Torah study, regular adult learning programs throughout the year, and her complete immersion into Jewish identity-building with her tenth grade confirmation students. She is one of TBT’s strongest voices for our Temple’s role of creating a close, cohesive Jewish community, as we celebrate simchas together and support each other through times of difficulty. We are proud that our Rabbi brings a commitment to partnership with our lay leaders and a strong desire to draw congregants into finding new paths to enrich their Jewish lives. Our Rabbi, Director of Education and Family Programs, our Early Childhood Director, our cantorial soloist and our Board of Directors set the tone for Temple Beth Torah being the warm, welcoming, mensch-likh congregation that it is. Rabbi Lisa is a recognized and respected leader of the interfaith community in Ventura, as well as in City and County leadership. She is a positive representative of the Jewish community in the broader community. We are proud that the good reputation which Temple Beth Torah has held in Ventura for eight decades continues under her leadership. Rabbi Lisa’s rabbinate is dedicated to opening the promise and meaning of a Jewishly-enriched life to all who seek it. She is as beloved with the children in our Torah school as she is with our congregation’s adults. 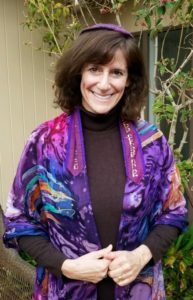 Rabbi Lisa was ordained from the Hebrew Union College-Jewish Institute of Religion in 1991 and earned her Masters of Hebrew Letters there in 1989; ; she continues her affiliation with the seminary by actively mentoring rabbinic students. Her training in Jewish Education was earned through Brandeis University’s Hornstein Program in Jewish Communal Service. She holds a degree in Journalism, and, in honor of her 25th year in the rabbinate, recently received her Doctorate of Divinity, honoris causa. She and her husband Rabbi Seth are parents of three daughters, who have been active participants themselves in temple youth, young adult, and Torah School programs.